A bone fracture is a medical condition inch there is some kind of break in a bone. These can come from direct impact onto the bone, abnormal forces through a bone, or repetitive stress on a bone. There are certain medical conditions that can weaken bones and contribute to fracture as well. Some examples are osteoporosis, bone cysts, and bone cancer. These kinds of fractures are known as pathological fractures. How do you know if you have a Foot or Ankle Fracture? Fractures can sometimes be diagnosed simply based on the history given by the patient along with clinical examination by your Foot and Ankle Specialist. X-rays are sometimes needed for diagnosis and to view the extent of the fracture. X-rays are also utilized to evaluate the progression of a healing fracture as well. Nearly one-fourth of all the bones in your body are in your feet, which provide you with both support and movement. A broken bone in your toes, feet, or ankles can be quite painful. Fractures that are displaced or in bad alignment may require surgery to realign the bones to allow them to heal in a good position. Fractures that don’t require surgery typically need several weeks of immobilization. What are the Signs and Symptoms of a Fracture? Pain, swelling, and bruising are the most common signs of a fracture in the foot and ankle. If you have a broken toe, you may be able to walk, but this usually aggravates the pain. If the pain, swelling, and discoloration continue for more than two or three days, or if pain interferes with walking, something could be seriously wrong; see a Foot and Ankle Specialist as soon as possible. If you delay getting treatment, you could develop persistent foot pain and arthritis. You could also change the way you walk (your gait), which could lead to the formation of painful calluses on the bottom of your foot or other injuries. 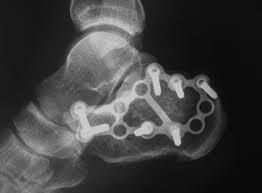 The Foot and Ankle Surgeon will examine your foot and ankle to pinpoint the central area of tenderness and compare the injured foot to the normal foot. You should tell the doctor when the pain started, what you were doing at the time, and if there was any injury. X-rays will show most fractures, although an MRI may occasionally be needed to identify stress fractures. 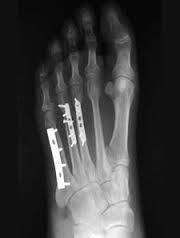 Usually, the doctor will be able to realign the bone without surgery, although in severe fractures, pins, plates or screws may be required to hold the bones in place while they heal. See a doctor as soon as possible if you think that you have a broken bone in your ankle, foot or toe. Until your appointment, keep weight off the leg and apply ice to reduce swelling. Use an ice pack or wrap the ice in a towel so it does not come into direct contact with the skin. Apply the ice for no more than 20 minutes at a time. Take an analgesic such as aspirin or ibuprofen to help relieve the pain. Wear a wider shoe with a stiff sole. 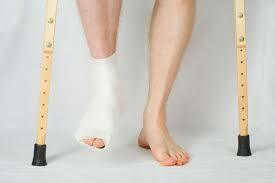 Rest is the primary treatment for fractures in the lower extremity. Stay away from the activity that triggered the injury, or any activity that causes pain at the fracture site. Gradually, you will be able to return to activity. The bone ends of a displaced fracture must be realigned and the bone kept immobile until healing takes place. If you have a broken toe, the doctor will "buddy-tape" the broken toe to an adjacent toe, with a gauze pad between the toes to absorb moisture. 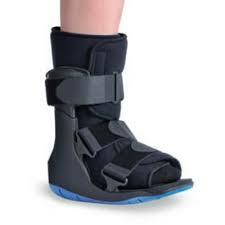 You may need to wear a rigid flat-bottom surgical shoe or off-loading boot for several weeks. If you have a broken bone in your forefoot, you may have to wear a short-leg walking cast, a brace, or a rigid, flat-bottom shoe. It could take six to eight weeks for the bone to heal, depending on the location and extent of the injury. After a week or so, the doctor may request another set of X-rays to ensure that the bones remain properly aligned.